The Constitution guarantees a citizen's right to the protection of firearms: "A well regulated Militia, being necessary to the security of a free State, the right of the people to keep and bear Arms, shall not be infringed." Unfortunately, our right which protects all other rights (including my right to tell you how important our right to bear arms is) is constantly under attack by well-meaning folks who think the world would be a better place if we just legislate guns away. solely in the State of California. 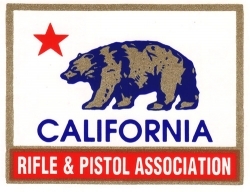 The National Rifle Association of America, or NRA, is an American non-partisan, non-profit organization which lists as its goals the protection of the Second Amendment of the United States Bill of Rights and the promotion of firearm ownership rights as well as marksmanship, firearm safety, and the protection of hunting and self-defense in the United States. Want to do more? The most important thing you can do aside from vote is contact your representatives at both the state and federal level. Every time you hear about a new proposed law which would further restrict a right which our founding fathers wanted to remain inviolate, you should let your voice be heard. The NRA makes this great tool available to you so that contacting your representatives is easier: Contact your state and national representatives!